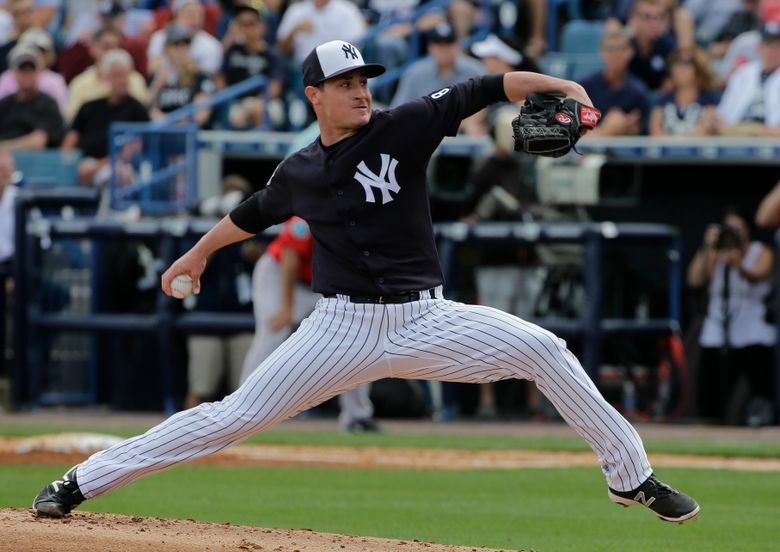 Seattle sent two minor league pitchers to New York in return for Rumbelow, who spent the 2017 season split between the Yankees' Class AA and AAA teams. General manager Jerry Dipoto made his third trade in four days on Saturday, adding some relief pitching depth to the Mariners’ 40-man roster. Seattle acquired right-hander Nick Rumbelow from the Yankees in exchange for minor league pitchers JP Sears and Juan Then. “Nick is another young, power-arm reliever who provides us with present flexibility and future impact,” Dipoto said. Rumbelow, 26, spent the entire 2017 season in the Yankees minor league system, splitting time between Class AA Trenton and Class AAA Scranton/Wilkes-Barre. He posted a combined 5-1 record with six saves and a 1.12 ERA in 25 relief appearances. He pitched 40 1/3 innings, striking out 45 batters while allowing just 11 walks. Opposing batters hit .150 (21 for 140) against him and did not record a home run. It was a solid year considering Rumbelow missed almost all of 2016 with “Tommy John” surgery for a torn ulnar collateral ligament. He made just one appearance with Scranton/Wilkes-Barre in 2016 before being placed on the disabled list and undergoing surgery on April 19. He made his big league debut in 2015, making 17 relief appearances and posting a 1-1 record with a 4.02 ERA. He struck out 15 batter sin 15 2/3 innings pitched. Rumbelow was a seventh-round draft pick in the 2013 draft out of LSU. Sears was selected in the 11th round of this year’s draft out of the Citadel. A strike-throwing lefty specialist with plenty of deception, he was dominant in his professional debut with stints at short-season Everett and Class A Clinton, posting a 1-2 record with 0.65 ERA with three saves in 17 relief appearances. He struck out a whopping 51 batters in 27 2/3 innings. Then is just 17 and started his professional career with the DSL Mariners in the Dominican Summer League this season, going 2-2 with 2.64 ERA in 13 starts. He signed as a non-drafted free agent in 2016 at age 16. He struck out 56 batters with 15 walks in 61 1/3 innings.